Thank you for further validating the reason I play at your tables and not at Steve Wynn’s or Sheldon Adelson’s casinos or eat at Mandalay Bay’s restaurants and not at Caesar’s Entertainment businesses. Yup. I noticed. Because it’s rare moment these days when a marketing department decision maker decides NOT to stick a trendy, overpriced MacBook in their advertising. Reserve a room on select nights* and receive $100 Resort Credit. Book Now or call Mandalay Bay Room Reservations at 877.632.7800 and ask for offer code PCYMON. My name is Kurt. I’m a UCLA Alumnus and a lifelong UCLA sports fan. Most importantly to you, I have been a season ticket holder for UCLA Bruin Football for the last 18 years. Prior to that, when I was an undergrad, I attended every single home game as part of the UCLA Bruin Marching Band and annually travelled to Stanford/Cal, and sometimes ASU. NO, SERIOUSLY. WE’RE DIEHARD FANS. I’ve had the same seats in the same area of the Rose Bowl for close to 2 decades now and I know the people around me like family. We’re the ones that stand up for the whole game and scream our collective butts off. Not just on 3rd down when Geoff says so… every down. It’s like we never left the student section. You have a very serious problem. WE’RE NOT ATTENDING GAMES ANY MORE. Over the last 2 home games, I’ve done what originally I thought was the unthinkable: I’ve voluntarily stayed home. And today, I made the very conscious decision not to attend again. What’s more… I’m liking it. I’m tired due to work in these economic times, I have obligations to my family, I don’t like how I’m now paying $20 to park & 2x what I used to for nachos, & I have other entertainment options – all of which have trumped my interest in attending UCLA football home games. The quality of UCLA football has dropped below the threshold of capturing my interest relative to alternative ways of spending my weekend. Now I’m not so egotistical to think that I as a fan am anywhere near the end-all-be-all metric of “the loss of fans” for UCLA athletics, however what should be distressing to you is that I’m not the only one: My entire crew of Bruin ultra-loyalists have collectively bailed on UCLA football, and you will notice a sizable set of unused seats in Section 1-H. Not even during the Dorrell era did this happen: Despite owning season tickets, we simply don’t attend any more and it’s a trend I’m noticing more and more across diehard fans/alumni I know. WE HAVE BETTER WAYS TO SPEND OUR TIME/MONEY. The logic is that now that we’re “at that age”, we’ve all got limited energy and we’re not really enjoying ourselves at the games. We can all find other forms of entertainment that are more worthwhile. watching the game on the DVR, skipping past lulls, timeouts, etc. UCLA’s literally losing diehards. Diehards with disposable income. Typically, our crew are the ones that illogically spend money on Bruin branded crap, establish tailgating routines before the games, create marketing buzz, hang out on UCLA forums like Rivals/Scout, buy officially licensed jerseys at ludicrous prices, take advantage of the 5%-25% discounts at the student store, (when we actually win a game) etc. We simply choose not to participate any more. Sure we have the cash to spend on attending a game, but it’s now become a matter of principle & energy expended: The prices are insulting, we’re not having any fun at the games, and blind team loyalty only goes so far when you’re competing against family time & personal energy. This isn’t a threat or an attempt to lash out mind you (well, except about the nachos – damn if those things haven’t turned to utter crap while doubling in price over the past decade) but rather a statement about where y’all are at. Because I know we’re not the only ones ‘dropping out’. So am I spending my time thinking about UCLA sports at all? Reading the articles? Visiting the forums? All the things about the ecosystem that makes an Athletics program profitable? Nope. My friends and I just shake my head in sadness, hopelessness, & resignation… kind of like the Lorax of Dr. Seuss fame. But the end of the story of the Lorax revolved around the word, “if”. 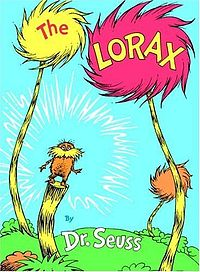 The Once-ler, the individual responsible for the desolation of the Lorax’s land, says that “if” someone is brave enough to do the right things and “bring back the truffula trees”, then maybe.. just maybe, the Lorax will come back. You are currently browsing the Kurt's Thoughts blog archives for November, 2011.